Get answers to frequently asked questions here. If you still need help, send us a message with your question and we'll have someone contact you right away! How cold does it have to be before I set up my rink? The obvious answer is 32°F (0°C). What our clients really want to know is, after filling up the rink, when is it ready for skating? That answer has several variables: how and what you set up/line your rink with; and, prevailing weather conditions. Liner - use a WHITE liner to prevent heat absorption from the sun. Using a liner that holds the water, your deep end should not be more than 10 inches (25 cm) deep. Boards - The outside of your boards should be a light color or covered with the white liner at the start to prevent heat absorption. Weather - Let the ground cool down for a good amount of time before lining and filling. Wait until the nighttime temperatures drop to 18 to 23°F (-5 to -8°C) and daytime temperatures stay below 36°F (2°C). With those conditions, you should be able to skate in three to five days. Cold nights are key, since you'll build more ice during those lower nighttime temperatures than the higher daytime temperatures can melt it and you will be gaining ice thickness each night. Typically, an ice thickness of 3-4 inches (8-10 cm) will hold most kids and average-size adults. Will a backyard rink/liner wreck my grass? How you set up your rink and what type of liner you use will determine the health of your grass. With a WHITE/WHITE liner and flooding the liner method, we have seen a 99.9% effective rate in turf health. On the other hand, if you use a clear, blue "tarp" or black liner, or just flood the grass, turf health will greatly diminish. Several factors will cause dead grass in the Spring: not enough sun penetration, too much sun penetration, or flooding the root zone of the turf. How big can I make my rink? Several factors go into determining the proper size of your rink. The first is your available space. If you have the space and budget, we recommend going big. You'll enjoy your rink much more if skaters have plenty of room to skate around. An important factor to consider when determining the right size of your rink is who will be using it. As a general skating guideline, about 100 square feet (3.5 sq.-m) per skater will allow for everyone on the ice to have ample space to skate without bumping into each other all the time. If it’s just for young children, you can go with a smaller 20' x 40' (6m x 12m) rink that you'll be able to expand in the future. An experienced skater, on the other hand, will be able to cover a 30-foot (9m) span rather easily with one stride, which might not be as much fun. As a quick note, when my son was 17-18-19 Jr A, our NiceRink® rink was 44' x 88' (13.4m x 26.8m) and it served him and his friends very well for 3 on 3, and even some 4 on 4 with the BIG boys out there. When deciding size, Also keep in mind that plywood and other NiceRink® rink materials come in 8-foot (2.4m) and 4-foot (1.2m) sections. This means rinks with widths and lengths divisible by eight or four are the easiest to put up and will have less wasted material. Use our NiceRink® Plotter to calculate the perfect dimensions for your rink and installation guidelines. So the choice is entirely up to you, as the "rink manager." But we can tell you we’ve heard time after time, "I sure wish we would've made it bigger!" Does my yard have to be level? There is no such thing as a completely flat yard and our rinks do not require a yard to be level. However, you must make sure to measure the slope of your yard BEFORE you start acquiring components and setting up the rink boards. View our simple video that demonstrates how to check the slope of your yard on the NiceRink® channel. When should I set up my rink? The best time to set up your backyard rink is just prior to when the temperature drops below freezing. This is for two reasons. First, you want to be all set up and ready to fill/flood when the freezing weather arrives. Second, it's a heck of alot easier and more comfortable to be working outside and installing stakes/brackets into the ground when it's 50°F (10°C) and the ground isn't frozen. When should I fill my rink? This depends entirely upon the weather rather than a specific date on the calendar. In Southeastern Wisconsin where we live, for instance, we usually install our brackets and sideboards the weekend before Thanksgiving (around November 15 or earlier) and then wait another two or three weeks before laying out the liner, in order to give the brackets and boards time to "freeze in" and let the grass go dormant. By then you'll have those good cold nights mentioned in question #1. Of course, this timeline varies greatly depending on where you are located. This basically comes down to time vs. money. There are a LOT of great problem solving NiceRink products available that you can simply "install" instead of having to "build." Custom NiceRink® Liners, NiceRink® Brackets, NiceRink® Boards, BumperCaps, KickPlates, Nets and endless other options. There are always going to be people that are very handy and have the tools AND the TIME to create their own board system. That's fine too! It can be as simple as a bunch of 2 x 4 (5cm x10cm) wooden stakes and plywood, or as eccentric as a complete refrigeration and board system. It can range from $200 to $100,000 and virtually anywhere in between! Once it's built, filled, frozen... Ice is ice! It's just how you get there. When using a liner you should always do ONE single fill. Most clients think that flooding in layers will work with a liner and get ice faster. When building a rink WITHOUT a liner, this would be correct. However when using a liner, and you have say 2” of ice on the liner and you’re looking to add another 2”…….You’d go ahead and drop your hose and “think” the water will go on top for you and freeze another 2” of ice. Unfortunately, that’s not what happens. What does happen is the new water ends up going UNDER the ice and the ice block you have then begins to float up. In theory this “Would” be OK too, BUT the liner is never perfectly flat on the bottom or the sides and there are a few wrinkles here and there throughout. With that, the original 2” ice block is frozen to those wrinkles, and when the ice block floats up, it takes the liner with it and/or scrapes against the sides and can create holes and tears. Very Sad indeed. You can however “carefully” break the edges of the ice 12-18” in from the boards and then “carefully” remove that ice so the ice block is free floating in the center and drop the hose and fill the remainder. Align the hose so that the warm water is running down along the edge of the boards. This will help keep that area thawed out, and many times creates a whirlpool affect and can thaw out all the edges around the rink. You can also the move the hose around to thaw out different areas of the ice. Keep an eye on it during the extra fill so that the edges of the liner remain free from the ice floating up. How much does a NiceRink® rink cost? You can calculate a custom quote for your NiceRink® rink using our quoter tool. In general, the cost of your NiceRink® rink can range from $365 for a NiceRink® 20' x 40' (6m x 12m) Rink-in-a-Box, to $4,035 for a 44' x 88' (13.4m x 26.8m) NiceRink® Gold Package to $26,000 for a 20' x 40' (6m x 12m) Refrigeration system. $365 = NiceRink® 20' x 40' (6m x 12m) Rink-in-a-Box. This is a "key components" kit to get you started on your backyard rink endeavors and allows you to expand in the future. You'll still need 3-5 sheets of ¾-inch (1.9cm) plywood at an additional cost of $200-300, which you can use to enlarge your rink in the years to come. $4,035 = NiceRink® Gold Package 44' x 88'(13.4m x 26.8m). This is a complete kit including NiceRink® Brackets, NiceRink® Plastic Boards, NiceRink® Liner, KickPlates, NiceIce® Resurfacer, BumperCaps, and more. Everything in the NiceRink® product family is made to last. Be confident in buying once and passing it on or reselling it down the road (the exception being the NiceRink® Liner -- see #10 below). $26,000+ = 20' x 40' (6m x 12m) regular refrigeration system with Coils, Anti-Freeze, and Refrigeration Compressors. This system guarantees you’ll have ice no matter what. But be aware that in addition to the steep price of this option, you'll also have an increase in your electricity bill. What is the best kind of liner for my rink – plastic or tarp? DON’T USE a liner that is clear or white/black, or a blue tarp. These are known grass killers! DO use WHITE-WHITE-WHITE-WHITE! make sure to get an Ultra-White liner on both sides. The double-sided white liner reflects the sun’s UV rays away from your ice so that it stays as cold as possible -- and will save your grass, too. DON’T USE a woven tarp. Keep in mind -- thicker doesn’t mean better. A woven tarp is heavier and harder to work with; and while it may be thicker, the bulk of the thickness comes from the woven reinforcement in between two very thin ½ to 1 mm of poly coating. Once that ½ mil coating is compromised you're basically left with a woven fabric that won’t hold the water. DO USE NiceRink® Liners which are 5, 6 or 10 mm of solid water-holding poly. Our layered liners at .005 mm are 50%+ stronger than most others even at .006 or .008. DO get the ONE-PIECE size you want. NiceRink® has ELEVEN different widths IN STOCK available in ANY length you'd like. No need to buy extra and throw it away in the landfills. No waste! If you are not satisfied with our product, we will offer a full refund of the purchase price less shipping within 30 days of date of purchase. The customer is also responsible for the shipping charges back. We continually try to improve our products based on customer feedback. We have never had anyone request a complete return due to damage or any other reason. If you see damage that you feel is unreasonable, send us pictures and we will reassess and discuss replacing. NiceRink® liners are warranted to hold the water when you get it. Other brands on the market may offer a 5-year "UV warranty." That's fine, but UV damage is not going to be the problem as the liners are covered with snow and ice during their use, so the UV doesn't affect the liner. Since every NiceRink® liner is made to order and custom cut to your exact specifications, we cannot offer a full refund should you want to cancel or change your order once the liner has been cut. If you MUST cancel your liner order and we have already CUT it, there will be a 25% liner cancellation fee charged to your account. I want to return a NiceRink® product I ordered. What is your refund policy? Before purchasing or returning any NiceRink® product, please review our sales policy. Where can I buy NiceRink® products in person? 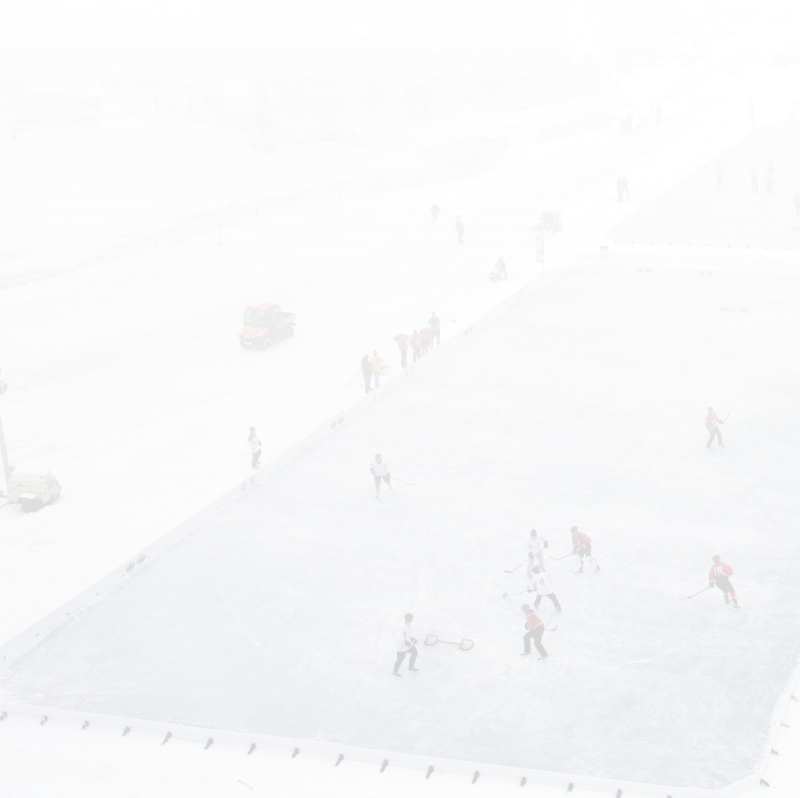 NiceRink® products are carried by over 100 dealers in the United States and Canada. To find a dealer near you, consult our NiceRink Dealer Directory. I live outside of North America? How can I order NiceRink® products? International orders (countries outside the U.S. and Canada) can be placed online, by phone (US: +1-888-642-3746), e-mail or fax (+1-262-279-6744). How will my purchase be shipped and how much will shipping cost? PLEASE NOTE: We require a $25 minimum order to ship. For shipments inside the U.S. and Canada, we use UPS Regular, UPS Freight, or Fedex. We will prepay all freight and add it to the invoice. For shipments to Canada: In addition to the regular shipping charge, all shipments to Canada will incur a brokerage fee from the shipper, plus all applicable taxes such as HST, GST, and PST. These amounts will be collected upon arrival if shipped via UPS/Fedex. If it is a truck shipment, brokerage fees and applicable taxes will be invoiced separately. On all international orders (on merchandise originating from the U.S.), please note that as the customer, you are responsible for all customs, duties, and taxes of your home country. When delivered, the delivery person may require an additional payment or you may be billed. These amounts due are the duties and/or customs brokerage fee (this is not a shipping charge). Please check your local rules and regulations prior to ordering for the total cost of these charges. Please note: for large truck shipments, if your item(s) are being delivered by common carrier (truck), do not sign for it until you have counted and verified all pieces are present and you have inspected the item(s) for damage. Once you have signed for the item(s), you assume all responsibilities and charges. Any missing items and/or damages must be reported within 7 days of receiving the product. What sales tax will I be charged on my purchase? Only Wisconsin residents will be charged an applicable sales tax. How long does a liner last before needing to be replaced? A liner’s life expectancy will be determined by two things: 1) what the rink is being used for – hockey or just general skating – and 2) how the inside edges of the liner are protected. The inside edge of the rink right at ice level is the most vulnerable part of any outdoor temporary rink system. If the inside edges are not protected with KickPlates, the liner will be continually hit with sticks, skates, pucks, toe-picks, etc. which will create little nicks and cuts in that part of the liner. If that's the case, you'll either have to shrink your rink the following year so the little nicks/cuts are above the water line; or, get a brand-new liner. All told, a regular poly liner might last from one to three years. Protecting the edges of the liner at ice level with KickPlates, however, will extend the life of your liner. NiceRink® #1 and #3 liners last from two to five years, depending on the rink’s use and how well the edges have been protected. How thick does the ice have to be? A good finished shallow side ice thickness is 4 inches (10cm). The deep end will be determined by the slope of your site. If you have an 8-inch (20cm) slope, then you'll have 12 inches (30 cm) of water on the deep side. Four inches (10cm) will give you a good solid base to work with and usually enough thickness to maintain ice during the mid-winter thaws that have become unfortunately increasingly common. Should I fill the rink up all at once, or do it ice layer by ice layer? When using a liner you should always do ONE single fill. Most clients think that flooding in layers will work with a liner and get ice faster. When building a rink WITHOUT a liner, this would be correct. However when using a liner, and you have say 2” of ice on the liner and you’re looking to add another 2”…….You’d go ahead and drop your hose and “think” the water will go on top for you and freeze another 2” of ice. Unfortunately, that’s not what happens. What does happen is the new water ends up going UNDER the ice and the ice block you have then begins to float up. In theory this “Would” be OK too, BUT the liner is never perfectly flat on the bottom or the sides and there are a few wrinkles here and there throughout. With that, the original 2” ice block is frozen to those wrinkles, and when the ice block floats up, it takes the liner with it and/or scrapes against the sides and can create holes and tears L Very Sad indeed. You can however “carefully” break the edges of the ice 12-18” in from the boards and then “carefully” remove that ice so the ice block is free floating in the center and drop the hose and fill the remainder. Keep an eye on it during the extra fill so that the edges of the liner remain free from the ice floating up. Filling a liner when it’s super cold and the water is freezing “while” filling…..When this occurs the ice sheet on top will rise as it fills and possibly scrape along the edges of the liner and potentially create holes in the liner. To help avoid this there’s three basic options to help prevent that from happening. If you can “flash flood” the liner that will negate the issue altogether. What that means is, getting the water in there faster than 1 hose. Utilizing your hose and 2-3 neighbors as well. That way the amount of warm (55F) water going in will fill quicker than it has time to freeze. Also, getting a water truck deliver your water, as they can drop 5-10,000 gallons rather quickly. Tell them not too quick so they don’t blow out the liner. Aim your hose down one of the lengths of your rink, so the warm water flows along the edge of the rink and keeps it from freezing with the warm water flow. You can rotate the hose from side to side, or utilize two hoses, one on each side of the rink. Keep breaking and removing the ice along the edges to keep the ice block in the center free from touching the liner. When adding more water to an existing ice slab, you have to make sure the edges of the rink are not “attached” to the liner on the sides. When you fill the water will go under the slab and raise the entire ice block up as it fills. If you fill and the ice is attached to the edges, when the ice lifts it will take the liner with it and most likely create punctures and/or tears on the way up. To prevent this, you can either run your hose along the edges to melt the ice from the edges or break the ice 12-18” from the edge of the rink and REMOVE the broken ice. Then you can fill at will to get more water into the rink with a much less chance of creating additional problems. Aiming the hose down one of the sides of the rink to create a whirlpool effect around the edges will help keep the edges free while refilling. You can and should also move the hose to different areas of the rink so you don’t melt a large area in one spot. There's water around the edges my rink. What should I do? All rinks built with a liner will have a shallow end and a deep end. The water the rink was flooded with will ALWAYS freeze from the top down. most of the time it will NOT freeze all the way to the ground and there will be water under the ice, especially in the deep end. When you have the backyard game going and several skaters head to one corner, the weight of everyone will force the ice down, and subsequently force a little water up in between the ice and the liner. It will even "gurgle" sometimes. For the most part, this isn’t a problem and the little water that does come will either retreat and/or freeze at the edge. My rink has slush. What should I do? All is not lost! The BEST thing to do is nothing! If you have just filled your rink and it froze over with a little ice and you get a big snow storm, the weight of the snow on the ice will force the ice downward. The underlying water will be forced up by the weight and pressure of the snow in-between the liner and the ice, turning the snow into slush on top of the skating surface. If your ice is too thin to get on and clean, you basically can do nothing. The best scenario is for the weight of the snow to push the ice down enough to force enough water onto the top of the ice so it ALL turns to slush. Let the slush freeze, and then you can skate on that base if it's smooth enough or resurface a few times to get it back to smooth. If it snows on ice that is already pretty thick (5 inches or more), and the slush is only around the edges of your rink, then you can tackle cleaning it off. We recommend calling "more than a few friends" over to help with this. make sure you clean ALL of the slush off of the rink in one session. Otherwise, whatever you leave on the ice can freeze overnight and you’ll wake up to ice that will be full of FROZEN foot prints, shovel marks or the step-up where you stopped. Once you clean all the slush off, let the surface harden back up, then resurface as needed to get it back to glass. How much water should I flood/resurface with? There are several methods for maintaining the ice. There is the flood method, spray and squeegee method, spray-spray-spray-spray, Hand Resurfacer and the Zamboni method. Below are descriptions of each approach. We leave the decision to you, the “rink manager,” for what works best for you and your rink. The Flood –The flood method is simply that: flooding. To flood the rink you'll need to have large hoses and above-average water pressure. You'll need to get the entire rink completely covered with water before any of it starts to freeze. Do not use the flood method on smooth ice, you'll wreck it. Spray and Squeegee – Again, simply spray water onto the ice surface and squeegee it out to the spots that need the most attention. DON’T try to squeegee areas that have started to freeze. You'll end up with mounds of frozen slush, which will have to be chipped or scraped off later when they freeze. Spray-Spray-Spray-Spray – The name says it all! The trick to spray coating ice is "wet ice is done ice." In other words, start spraying a spot on the rink until it's glossy and then move on. Put the layers of water on as thin as possible to get a "Nice" glass-like finish and also to prevent cracking or "lifting." How water freezes will help explain lifting. Water normally freezes from the top down and it also expands as it freezes. Therefore, if you put too much water on the surface and it starts to freeze, you will wind up with three layers: base ice on the bottom, then a layer of water, then a top layer of fresh ice. As the water in-between the two ice layers starts to freeze, it will also expand. But it can only expand up into the fresh ice, which causes the lifting of the fresh top ice layer. The result is a bumpiness and often unevenness (which is known as "shale ice”). To remedy this situation, you can apply thin layers of water that will freeze solid with no expansion and give you the glass like finish you’re after. This method, however, is also the most time-consuming. A 44' x 88' (13.4m x 26.8m) rink will take anywhere from a half-hour to 1-½ hours of spraying or more, depending on the temperature and ice condition you have to start with, to get the ice back to glass. That’s why we recommend the NiceIce® ice resurfacer. See below. NiceIce® Resurfacer – The NiceIce® ice resurfacer is the best and most economical method of resurfacing any ice rink. My personal backyard rink is 44' x 88’ (13.4m x 26.8m). It takes me a whole 12 minutes to put on a fresh coat of ice -- as opposed to the hour-plus it used to take me when I would spray coat a new layer of ice. Not only did I cut down my time by 80%, I also used less water and wound up with a much better ice surface to skate on. I usually put two coats on. The second coat takes less time than the first and provides a surface that rivals indoor ice quality. The single biggest detriment to ice is the air contained within it. Do you remember skating out on the ponds and lakes? How when you made a sharp cut you'd get a big groove in the ice? The groove gets formed because too much air is contained within ice, allowing the skate to easily dig in and groove out the surface. Your base ice is basically the same as pond ice until it gets resurfaced and layered a couple of times. When you use our patented NiceIce® resurfacer, you will be laying down a very thin, fast-freezing layer of deoxygenated water that will then become your skating surface. You now have the same ice surface that is laid down on the indoor rinks -- and sometimes better. Hard, deoxygenated ice is good, fast ice and will not get chewed up as much. It requires less maintenance time so you can have more skating time. The NiceIce® resurfacer is also great when Mother Nature doesn't cooperate like we would appreciate. When she dumps snow, rain, sleet or slush, it has a definite tendency to mess up a rink surface very quickly. The NiceIce® resurfacer can lay down approximately ¼" (0.635cm) to ½" (1.3cm) of ice in an hour, depending on the outside air temperature which usually takes care of even the most severe rink surface in a maximum of 3-4 hours of walking. My ice cracked! Why and how can I fix it? Inevitably when when resurfacing and when it gets extremely cold the ice will obtain some cracks. First, let's answer why this happens. When resurfacing, even with cold water, to the ice ANY water you put on the ice, is warmer than the ice itself, Even cold tap water comes out 55F/13C. Combine that with the best resurfacing happening at 25F/-4C and you get a 30/17 degree temperature differential. So just like pouring, even cold water over a glass full of ice...it will pop and crack while filling up. When it gets extremely cold, say 5F/-15C your ice freezes "solid" and the winter air dries out and pulls the moisture out of everything, Including your ice. That water "was" the glue that was holding the ice together. Once the winter air dries out your ice, and the moisture has been depleted you will get 1-2-3-4 cracks the entire length of your rink. We call them Spider Cracks. Just like you may have seen on TV or the local rink when a hole is created in the ice, the ref or players will scrape some ice shavings, pack them in the hole, wet it and then smooth it over with a puck. Same goes for your backyard rink. Grab some snow (assuming you have some), and pack it in the holes and cracks, wet lightly and smooth over the best you can with a puck, or even a concrete trowel and let it freeze. Before you get any cracks, or when you fix any holes or cracks you have in the ice, and it's cold enough and going to stay cold enough to keep your ice frozen, you should put many "thin" layers of water/ice on the rink, letting each layer freeze before adding another layer. This will give you a harder layered ice surface on the top and be less prone to cutting, chipping, and cracking as long as that "layered" ice stays frozen. Can I install my liner on top of Snow or Ice? Laying over snow, the snow in the shallower area may suspend the water/liner above the ground because there’s not enough water weight to push the snow down. Then the water freezes like that with the ice thin and suspended above the ground. Then, a grown adult or several kids skate over that thin ice area (that you can’t see) and it breaks and collapses to the ground. Broken ice, most likely a cut liner, and possible injury from the fall. This can be partially avoided by stomping all the snow down flat to the ground. BUT the recommendation is to just snowblow or shovel it out…..Why take the chance. Laying over ice, there is a “potential” that the weight of the water could break/crack the ice underneath the liner. The ice edges can be VERY sharp, and the weight of the water pushing down on the ice edges has a potential of puncturing the liner. A cheap blue woven tarp can be placed over the ice to help protect the water holding liner. I suppose a thin layer of snow as cushion may help as well. Quick Summary: NiceRink liners are very strong, but not bullet proof. Much better to be safe than sorry. Just because the liner may be leaking doesn't necessarily mean it's the seams in the liner. The edges could've been damaged, a dog could have run through it, the neighbor could've poked holes in, a deer could've run through. These all sound like craziness, but these have all happened, amongst about 50 other problems. Once you find the hole (source of the leak), GET PICTURES. If it is determined that it was in fact a faulty liner, then of course we stand behind our product. Stand in the center of the wet spot, facing directly up to the shallowest point of your rink. Now, it may not be directly in line, so start at the board edge checking 2’ left and right from where you are standing, and be sure to check the inside edges of the liner where the liner is against the board(s) first, then work your way down the board and then look on the bottom of the liner where it is on the ground, double/triple checking where the board meets the ground. Then, from there facing directly uphill again, carefully and thoroughly scan the bottom of the liner left & right, and as you scan further up towards the shallow end, begin to expand your scanning area left & right as you scan further away from the boards. You scanned 2’ either way near the board, and I would suggest when your 15’ uphill or more into the rink that you be searching an area that would then be 5’ left & right, or 10’ area side to side. To scan closer “in” the rink, you can place plastic garbage bags over stocking feet and carefully walk around in the water. If there’s a thin layer of ice, you can carefully break and remove the ice so you can see the liner. *** If you already have ice on the rink, I would say 3” or less, you’ll have to “carefully” break the ice with a hammer 12-18” from the sideboards and remove the ice in order to check the sides and/or the bottom for holes in the immediate area. Another technique I’ve heard clients try is to add food coloring to a cup of milk and pour that in the water when it’s calm. The food coloring in the milk is heavier than the water and has tendency to follow “the flow” to a potential hole. Drop the coloring close to where you think the hole might be, go away for a while and then come back to see if you have traveling color to a hole. Once you find it then see: "Repairing a NiceRink Liner"
Repairing a hole in a NiceRink Liner. Repairing a NiceRink Liner-Inevitably some of you will get holes in your liner, whether from skates, sticks, shovels, dogs, deer, or the plastic football place kick holder left under the liner. Laugh if you will, we’ve had more than that come back to us since 1991. There are basically two options in repairing a liner. You can use either the NiceRink repair tape OR the underwater glue. They do not work together. One works independent of the other. Taping a liner-The liner “should” be warm, dry & clean that will be the easiest…..however….if you have a midseason hole or tear there are ways to fix it, just call and ask for the “Rink Doctor”. In optimum conditions, clean and dry both sides of the liner and tape both sides if accessible and press the tape in to place. If it’s a midseason fix, get Mama’s hairdryer out with an extension cord! Clean and dry the area to be patched as well as possible and cut a piece of patch tape according the size of the hole. Place the tape over the hole, and it will most likely not stick in place. Hold the tape in place and turn on the hairdryer and apply heat to the non-adhesive side of the tape and at the same rubbing the tape with your free hand. This will activate the adhesive through the material, and once activated, you should get a permanent bond. You don’t have to burn it on, just heat it up from the back and test the adhesion periodically by trying to remove a corner while heating up and you’ll be able tell when it’s adhered. Underwater Gluing a liner, Don’t read the directions on the tube of glue! This works, I had a deer put 15 holes in my liner in one run across it about 12 years ago with one of the original lining materials. The glue is not going to dry and be a permanent fix. This is only intended to “clog” a hole that is underwater midseason. I would suggest rubber medical gloves and a dry towel for this as the water is going to be VERY cold! Keep the glue in a warm area until ready to apply. For smaller holes, take a generous amount of the glue, 1” diameter should do for smaller punctures on your index finger and bring it down to the hole and sort of “smear” it over the hole and release it from your hand. What the glue will do is stick to the liner essentially “clogging” the hole up until spring when it can then be repaired permanently with the tape. For larger holes, use a scrap or corner piece of liner larger than the hole, apply a generous amount of glue around the edges of the patch piece, and then push that down over the hole in the water and apply pressure around the edges to get a seal. Then seal off the edges of the patch with more glue to make sure you get it all sealed up. Some clients have put a flat stone or brick that does not stick out of the water on top of larger patches and then just let it freeze into the ice to be sure there is enough continuous pressure to seal off larger holes that are underwater glue patched. My Rink has Frozen Slush-Foot Prints-Shovel Marks-High Spots, etc…. Best thing to do is knock down any high spots as much as much as possible with an ice chopper, or you can hit the tops of the high spots with a hammer and smash them down, Once you have the majority of the high spots knocked down, you can use a leaf blower or broom to get all the ice chips to one corner and remove them with a shovel. Then you can put a little heavier flood on the ice either directly from the hose or what we affectionately call “Bucket Dumps”. The principle behind these methods is to get a good amount of water on the rink as fast possible so the water will naturally flow to the low spots and start “filling them in”. This isn't going to be done in one dump/flood, you'll need to flood a 1/8" - 1/4" layer at most, let that freeze, and then do that again until you think the resurfacer will be useable. For the bucket dump, get either a bunch 5 gallon buckets, muck buckets, garbage cans and spread them around the rink in the areas you need to fix. Fill them all up with a manageable amount of water that you can pick up and dump. After they’re all full, go around and dump them on the ice so the water flows to the middle of the ice. If you have a layer of water on the whole ice surface, then stop, let that freeze up and repeat. Once you can use the resurfacer, and when you get a good cold night, dress warm and put on as many thin of coats of water as you can. The goal is to make sure that each new layer freezes by the time you're done with one layer, so you can go right ahead and start applying another layer immediately. Do that continuously for a bit and you should get the ice back smooth in short time. Why isn't the deep side of my NiceRink freezing? This is natural occurrence with freezing a large pool of water. Water actually freezes from the top down, and keeps creating ice from the top, down as long as it is below 32F/0C. Just like a lake or pond the surface skims over first and then it freezes downward with freezing temperatures. The NiceRink white liner will expedite this process, but it just takes the natural cold weather to keep freezing. A backyard ice rink doesn’t have to freeze solid to skate. Usually 4” of ice is enough to go ahead and skate. Here are some scientific study someone compiled on ice growth over time based on temperature. Keep in mind this study is for “lake/pond” ice and the backyard NiceRink ice will freeze faster, as there is less water depth, and less warm water thermal influence from below. Shale Ice: Why did it happen and how to fix it. Do nothing, resurface a few more “THIN” layers over it to build a skateable thickness over the air pockets and skate away. Use a jet stream on the hose, create a small hole in each bubble pocket with the hose and fill it in as best you can, let freeze and repeat. Break all the air pockets, remove all the shale ice chips and then resurface a 5-10 layers with a resurfacer, letting each layer freeze in between before adding the next. The resurfacer will leave water in the lower areas to build ice and drag the higher areas to bring them down. Eventually the lower areas will catch up with the higher areas. There should only be about a ¼” drop in the low areas after breaking the ice chips out. My KickPlates are lifting up. Why & What is the fix? If you can, see if you can actually pull the KickPlates out of the ice and then you should be able to gently pull on the boards backwards to create enough space to CAREFULLY slide them back into place. If it’s going to be warm, pull them out and leave them out for a day or two, let the edges melt a little more and the task may become easier so. You can also help it along by running water down along the edges to melt a little more gap between the liner and the ice. The reason this happens is due to the expansion and contraction of the ice during freeze/thaw cycles, coupled with the temporary nature of the rink. If it was a permanent install, then one could simply screw the KP’s right to the boards and be done with it. To “help” hold them down, one could also tape them to the liner where the seams are. Part of the tape on the KP, the other part under the next KP. This way the tape can “help” hold the KP in place.